I have been thinking about this Buttermilk Pudding Cake for quite some time. When I saw it's photo, with those carmine-coloured berries all snuggled up against a cushion of tender, melting cake, the image stuck with me. It looked like all things dreamy, served up on a spoon. Nevertheless, with such a short ingredient list, the skeptic in me raised a singular eyebrow - something the actual me cannot do without looking oddly quizzical or slightly pained. Could such a meagre collection of ingredients really amount to a dessert that lived up to its looks? Oh my yes. If I was not blissfully married already, I would be writing Mrs. Tara Buttermilk Pudding Cake over and over in notepads, with hearts all around. I might whittle a million pencils down to the tiniest of nubs, and my hands could cramp, but I wouldn't care. Not at all. I am head-over-heels lost over this cake. After getting all your bits and bobs in order, this is a cake that takes all of five minutes to make (with a mixer, a little longer by hand), but tastes exponentially better than the effort it requires. After stirring and whipping the disparate components, they are folded together into a marshmallow-tender batter. It sighs and slips its way into a pan, baking gently until pouffed on top and turned luscious below. The only gentle suggestion I might offer would be to switch the raspberries for fresh peaches, as around here, raspberries are terribly last month. We live in peach-growing country, and at present the trees are heavy with their weight. For this, you want the ample-bosomed variety, full and soft, with a velvet skin that begs you to nuzzle in close and get a bit familiar. That yielding flesh mimics the softness of the cake's custardy belly, in delicious repetition. And now that you have been formally introduced I do believe you should give this cake a thought as well. If you require more reason than the case I have laid before you, you could be like me, and take my unabashedly shameless excuse, disguised under a flimsy veil of altruism. First, agree to make a recipe for a loved one that requires buttermilk, then accidentally-on-purpose purchase more buttermilk than said recipe requires. Wait a few days. Finally, choose a quiet afternoon to nobly bake the aforementioned Buttermilk Pudding Cake, as you wouldn't want the excess to go to waste. Wink, wink, nudge, nudge. Everybody wins. On a personal note, I want to dedicate this post to the talented and breathtakingly-honestJess. She mentioned elsewhere that this dish took her fancy, and as she's been through more in her 28th year than many go through in decades, the least I could do is offer her something that might make her smile, as if to say - "We're so glad to see you on the other side." From Gourmet.com, with minor changes. As you can see from the telltale marks on the dishes, this cake soufflés beautifully in the oven, but collapses quickly upon its removal from the heat. For the prettiest presentation, I would take the cake straight from oven to table in its fully plumped glory, then cruelly make your guests wait as it cools. 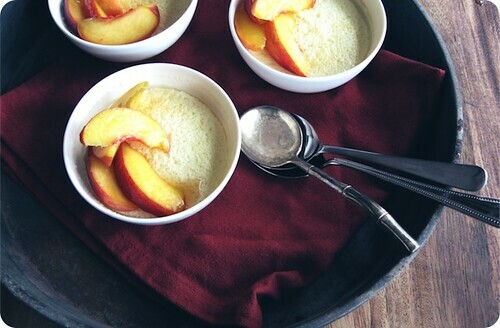 In a medium bowl, gently stir together the peaches and enough maple sugar or syrup to sweeten to taste. Allow to macerate at room temperature while preparing the cake. Preheat an oven to 350°F (175°C). Lightly butter the inside of a 1 1/2-quart shallow baking dish. Set aside. In a large bowl, whisk together the flour and salt. In another mixing bowl, whisk together the buttermilk, butter, egg yolks, and 1/3 cup granulated sugar until well combined and the sugar is pretty much dissolved. Add the liquids to the flour mixture, stirring until just combined. Set aside. In a large mixing bowl, either by hand or with a mixer, beat the reserved egg whites on medium speed until frothy and opaque. Increase the speed to medium high, or if by hand beat faster, and start adding the remaining sugar a tablespoons at a time, beating well to incorporate each addition. Continue whipping the egg whites until they just hold a stiff peak. Do not over beat. Working quickly but gently, stir about one-third of the egg whites into the prepared batter. Once almost combined, add another third of whites, this time folding the batter over the whites to incorporate thoroughly. Repeat with the last of the whites. Pour the batter into the prepared baking dish, place this dish in a larger dish or roasting pan, and pour hot water from a recently-boiled kettle in the larger pan until it comes halfway up the sides of the smaller. Bake the cake in this water bath in the preheated oven for 4- to 50 minutes, until puffed and golden. 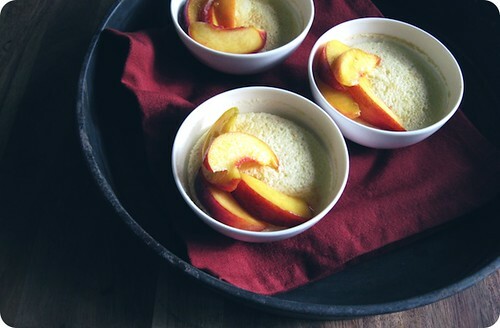 Remove from the oven and allow to cool 5 to 10 minutes before serving with the peaches alongside. Serves 6, but I would really think 4, greedily, is the way to go. Sharing is difficult with this one. • I used Brien's superfine maple sugar, which has lighter taste than others I have tried, with an understated sweetness rather than that throat-warming hit associated with maple syrup. I further preferred maple sugar over syrup as it seemed to draw more juices out of the peaches, and thickened those juices only slightly.